Raumfahrt - Ist NASA vom Mars Besessen geworden ? Mars-Chroniken - NASA-Status-Bericht zur ersten "Mars-Bohrung"
(Dulles, VA 22 February 2013) -- Orbital Sciences Corporation (NYSE: ORB), one of the world’s leading space technology companies, today announced it successfully conducted an extended-duration “hot fire” test of the first stage propulsion system of its new Antares™ medium-class rocket. Developed over a four-plus-year period, Antares will be used to launch cargo supply missions to the International Space Station as part of a $1.9 billion contract with NASA. The 29-second hot fire test took place at 6:00 p.m. (EST) on February 22, 2013 at the Mid-Atlantic Regional Spaceport’s (MARS) Pad 0A, which was designed and built over the last several years to accommodate liquid-fuel space launch vehicles. The primary goals of the test were to ensure that the launch complex’s fueling systems and the Antares stage one test article functioned properly in a fully operational environment, that engine ignition and shut down commands operated as designed, and that the dual AJ26 first stage engines and their control systems performed to specifications in the twin-engine configuration. The test included a full propellant loading sequence, launch countdown and engine ignition operation. The pad’s high-volume water deluge system flowed throughout the entire period of the test to protect the pad from damage and for noise suppression. With the hot fire test complete, Orbital will purge and clean the engines of residual propellants and return the first stage test unit to the vehicle integration facility for full reconditioning. Shortly after completing pad and fueling systems post-test inspections and performing any necessary reconditioning work, Orbital will roll out the first complete two-stage Antares rocket to prepare it for the test flight, which is expected to take place in approximately six weeks. Orbital is scheduled to conduct two launches under the Commercial Orbital Transportation Services (COTS) Space Act Agreement with NASA in 2013. In addition, the company will launch eight operational cargo resupply missions to the International Space Station (ISS) using Antares vehicles from late 2013 through 2016 under the Commercial Resupply Services (CRS) contract with NASA. The COTS and CRS flights will launch from NASA’s Wallops Flight Facility in eastern Virginia, which is ideally suited for ISS missions, and can also accommodate launches to other orbits. 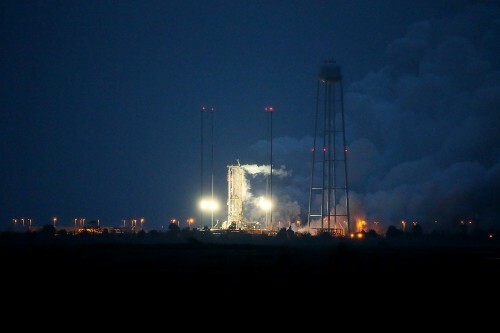 In addition, Orbital is currently evaluating its options for development of a west coast launch site that would enable the Antares rocket to address an even wider range of customer missions. The Antares medium-class launch system will provide a significant increase in the payload launch capability that Orbital can provide to NASA, the U.S. Air Force and other customers. The Antares rocket will be able to launch up to 14,000 lbs. into low-Earth orbit, as well as lighter-weight payloads into higher-energy orbits. Orbital’s newest launcher is currently on-ramped to both the NASA Launch Services-2 and the U.S. Air Force’s Orbital/Suborbital-3 contracts, enabling the two largest U.S. government space launch customers to order Antares for “right-size and right-price” launch services for medium-class spacecraft. Orbital develops and manufactures small- and medium-class rockets and space systems for commercial, military and civil government customers. The company’s primary products are satellites and launch vehicles, including low-Earth orbit, geosynchronous-Earth orbit and planetary spacecraft for communications, remote sensing, scientific and defense missions; human-rated space systems for Earth-orbit, lunar and other missions; ground- and air-launched rockets that deliver satellites into orbit; and missile defense systems that are used as interceptor and target vehicles. Orbital also provides satellite subsystems and space-related technical services to government agencies and laboratories. More information about Orbital can be found at http://www.orbital.com. Follow Orbital on Twitter @OrbitalSciences. SACRAMENTO, Calif., Feb. 22, 2013 (GLOBE NEWSWIRE) -- Aerojet, a GenCorp (NYSE:GY) company, announced that its dual AJ26 main engine system successfully powered today's Antares™ Stage 1 Hot Fire test conducted by Orbital Sciences Corporation (NYSE:ORB) at the Mid-Atlantic Regional Spaceport located at NASA's Wallops Flight Facility on the eastern shore of Virginia. The 29-second test enabled engineers to validate flight configuration checkout of the Antares main engine system and first stage booster. During this "strap down" test, the AJ26 engines produced approximately 680,000 lbs of sea-level thrust. "Today's successful stage test positions us one step closer to supporting Orbital's historic flight test," said Aerojet Vice President of Space & Launch Systems, Julie Van Kleeck. "We're proud to deliver for the Antares team and we're looking forward to continuing the countdown toward the inaugural mission." The AJ26 is a commercial derivative of the NK-33 engine that was first developed for the Russian N-1 rocket. The NK-33, oxidizer-rich, staged-combustion LO2/Kerosene engine is among the highest thrust-to-weight ratio of any Earth-launched rocket engine. "Aerojet purchased the NK-33 engines from JSC Kuznetsov in the mid-1990s and has been developing design modifications to ensure that the AJ26 is suitable for U.S. commercial launch vehicles," said Aerojet Executive Director of Space & Launch Systems, Pete Cova. "As teammates, JSC Kuznetsov brings tremendous technical support to our efforts and we are looking forward to supporting Orbital in its Cargo Resupply Contract with NASA."